Mack started walking when she was nine months old, and almost immediately she exhibited advanced hand-eye coordination and impressive athletic abilities. By the time she was three, she was adept at throwing and catching a baseball, dribbling a basketball, and throwing a tight spiral with her kid-sized football. Early in elementary school, she brought home every sports flyer available and begged to participate. With the exception of ice hockey, we let her try every damn sport, too: soccer, baseball, basketball, taekwondo, tackle football, and flag football. She was an amazing athlete, and I was always in awe of her ability to pick up a sport and play it well. I started playing golf when I was about thirteen years old, and I’ve loved the game ever since. When my dad taught Mack to swing a club when she was just five years old, I knew she would be good at that sport, too. In Springfield, the public courses allow kids to play at age six, so I purchased a set of junior golf clubs for Mack’s sixth birthday, gave her some lessons and then started taking her on outings with me. 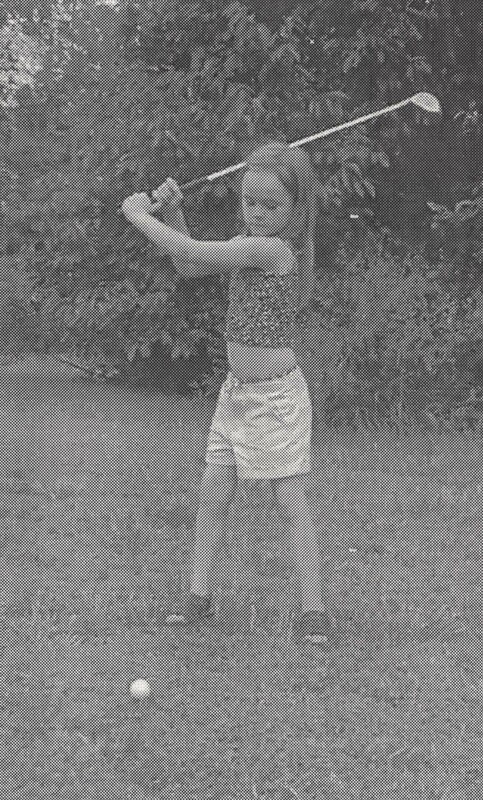 By the time she was ten, she hit the ball from the tee much, much, much further than her momma, but she never really adopted the sport. Oh, she enjoyed the game…at least a little…but she was always annoyed with the course etiquette, the “country club” attire and the general attitude of many male golfers she encountered who believed women and girls on a golf course were an annoyance. I also think Mack had a clear preference for competitive team sports. Sharing a basketball court with a group of friends was more enjoyable to her than a lonely walk up a fairway. I understood that about her; but I was always a little sad about it. Over the course of the next nine years, I had to just be content to enjoy a couple of rounds of golf with her every summer. In July of 2008, just a month before she was going to be starting her freshman year of high school, Mack announced that she was going to try out for the golf team. I am pretty certain I just stared at her for a long time looking incredulous. She probably stared back, sucking in her lips and looking at me sideways. She did not own a decent set of golf clubs appropriate for her height. She had no golf shoes or a proper golf bag. She had not been playing golf all summer to prepare. She had never in her entire life taken a professional golf lesson. She said the golf team tryout was in a few days, and she asked me to go to the driving range with her and to take her to play a couple of rounds of nine holes at Pasfield (a short course near our house) beforehand. I asked her if she thought it would all be enough preparation to make a high school golf team, and she said that she had never failed to make a team before and she had no intention of breaking that streak. I am sure that I sighed in response, but we went to the driving range, we played a couple of rounds at Pasfield, she went to the tryout in basketball shorts and flip-flops and then became a freshmen member of the Springfield High School (SHS) girls golf team. Well it turns out that there are not that many girl golfers in Springfield, and many of them go to Sacred Heart-Griffin (SHG), the rival private Catholic school. So Mack was probably pretty certain that she would make the SHS team when she so confidently answered my incredulity. However, she really did have a natural ability, could knock the cover off of the ball from the tee, and possessed such a calm approach to the game that she soon started to excel at it. She was never going to take the game as seriously as was necessary to be great at it, but she really did work hard to improve so that she could be pretty damn good at it. She started taking lessons from a local pro, practiced her putting and chipping on her own time, and listened to the advice of her golf coach with whom she quickly developed a special bond. It was no surprise to anyone who knew her that she quickly played the game well, but I’m not sure everyone recognized that her adoption of the game and her success with it had taken her a little outside of her sports comfort zone. Just because she was playing “real” golf did not mean, however, that Mack accepted all of the “country club” aspects of the sport. She practiced in flip-flops, wore baggy sweatpants in lieu of fitted golf skorts, cussed and chortled on the putting green, and refused to accept the lonely silence of the sport. When her peers were taking practice swings on the driving range before matches, Mack was in the clubhouse testing out the local hot dog. After a match when her peers were bragging about a beautiful approach to a tight green, Mack humorously regaled them with the horrors of her worst shot of the day. At first, her golf coach, a few of the more serious members of her own team, and her opponents were taken aback by what they saw as her irreverence for the game. But after they got to know her, they learned that she didn’t disrespect the game at all. She just wanted to play it her on her own terms. 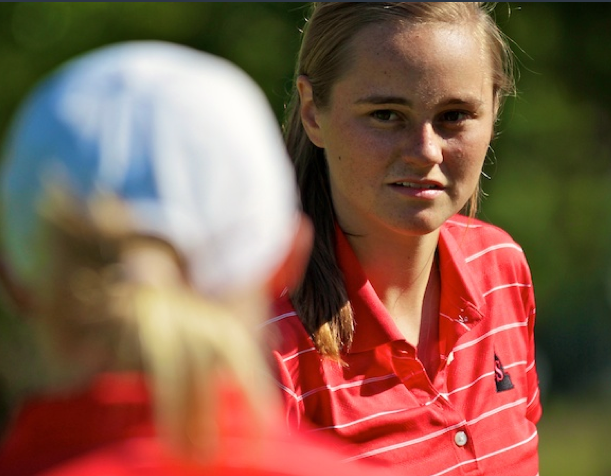 In her four years on that high school golf team, Mack always downplayed her successes and she laughed at her failures; and that attitude made her a better golfer. Most importantly, she made the game her own by turning it into a team sport. She interacted with the golfers on her team the same way she interacted with her fellow basketball and softball teammates. She demanded team dinners, made up stupid handshakes and cheers, and provided levity when teammates were taking the game too seriously. For Mack, golf was NOT a lonely walk up the fairway. During matches, she engaged her opponents, shared her humor, and treated them like teammates as well. In fact, Mack became good friends with the SHG golfers and their coach; and her personal idea of team extended to them as well. After all, she actually spent more time during matches with SHG golfers than with her own teammates or other opponents, so why not bring them along for her joyride in the sport? By senior year, Mack was playing some pretty good golf. She was still practicing in flip-flops and consuming hot dogs instead of warming up before matches, but I could see that she really wanted to make her senior year special. She practiced harder, visited the golf pro more, and provided a great deal of encouragement for the entire team. At Sectionals that fall at Lincoln Greens in Springfield, no one dared to dream that the entire team could make it to the state tournament. 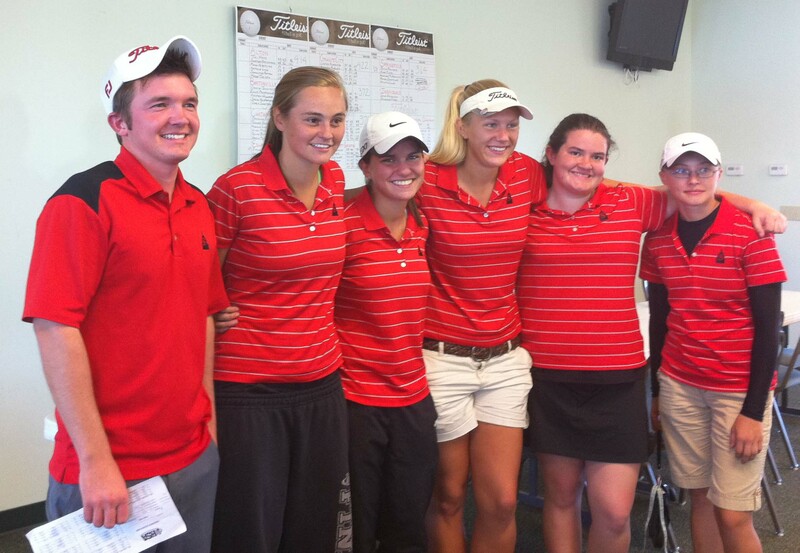 The team’s two top golfers each shot 81 and were definitely on their way to State. Lincoln Greens was always something of a challenge for Mack; many of her funniest ball-in-water stories came from that course. But on that beautiful sunny fall day, she put her head down and carded a 90. I am fairly certain it is the best score she ever turned in for eighteen holes at Lincoln Greens; and it had come at the perfect time. More importantly, however, that score turned out to be just low enough. The final combined team score qualified all of the SHS golfers for the Illinois State Golf Tournament for the first time since the 1980s. Mack was never more proud of any other athletic achievement. She was thrilled that all of them—Becca, Alax, Kristin, Rachel, and Mack—were going to state. All of them. Mack was right. Golf was a team sport after all. People who live in Springfield know that the rivalry between SHS and SHG is pretty intense and can, sometimes, become ugly and bitter. In fact, it has a tendency to bring out the worst in even the best kids. But as it turns out, my Mack was so special that her spirit could melt even the iciest of rivalries. 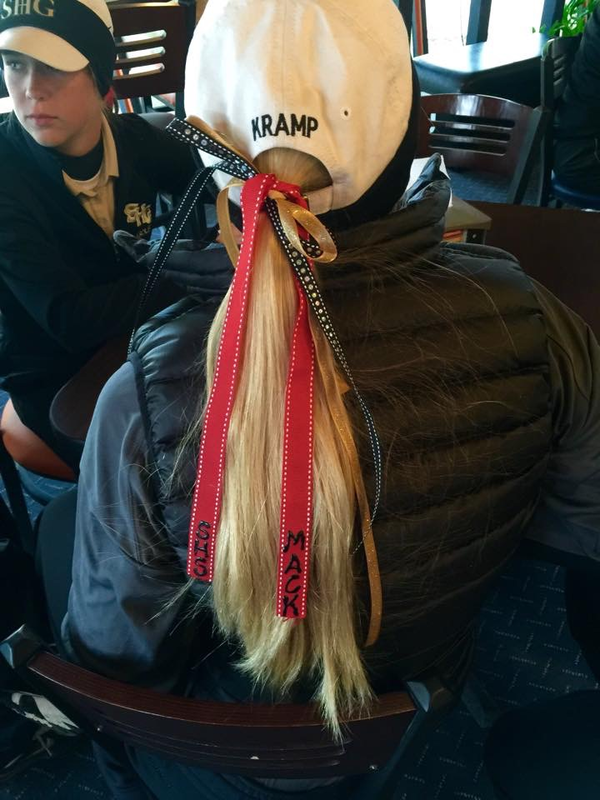 In October, while they were competing in the sectionals golf tournament, the SHG golf team wore ribbons in their hair to honor the memory of their lost competitor and friend. They were competing for SHG, but they wore red “Mack” and “SHS” ribbons. What an amazing testament to a beautiful person. Mack’s friend and golf teammate, Alax, adds this little story: “I remember one day at practice she tried to hit the ball with her bag on her back and ended up losing most of the clubs in the bag.” I can certainly picture her doing that! Alax also reported that she never understood why Mack carried two putters, but admitted it was a Mack thing. This blog made my heart smile. I’ll never forget that day Mack tried out because her and I grew up playing softball and basketball and now adding golf was awesome! Let me tell you when we found out we were going to state. Mackenzie McDermott and I were more focused on Jake Stapleton and not even watching the scores. Once all the scores came in Mack and I seriously hugged for what seemed like forever and then we ran to Stapes who just had this big cheesy grin on his face. That day we wanted to make him proud for the 4 years he had us and I think we accomplished that. The goal of that year for Mack and I both was to go out with a bang. SHG wasn’t looked at as being rivals in our eyes in women’s golf. Mack and I were sitting with our second family (SHG) at Buffalo Wild Wings early on in season and made the statement we were going to work hard to get to state because after all having SHS and SHG together at state would be the best. After that, that word stuck to this day and will forever. Contribution..it’s more than just a word, it’s more than a funny awesome memory, it now has an even better meaning because Mack made contributions to so many people’s lives and she’ll forever be in our hearts. When we learned what state was about that year Mack and I made a promise to come back our senior year and we knew it was possible. That day at super sectionals realizing we overcame so many doubts from people was the greatest feeling and I always go back to that day whenever there’s a doubt in my mind. Mack made golf the best sport not only for me but everyone on the SHS team, SHG team, Ciotti (shgs coach) and Stapes. Every time I set foot on Lincoln Greens or Bunn memories come flooding into my head because we had so many there. They all have always brought a smile to my face, but now they make me smile a little bit extra. I’ll never forget our heart to hearts, our TV show talks, our book we began to write on “how to make a good drive go bad” and our countless hand hugs because they will always live on in my heart and in those fairways. I love you Mack. I miss you so much. Thank you for all your contributions. When I think of my senior year golf ,Mack is the first person that comes to mind! To us on the SHG golf team, she was part of the family. SHS & SHG were no longer rivals, but family! She made that year memorable and one of the best ! Mack had the most fluid golf swing of anybody I ever played with. It was just a natural skill, and I remember being blown away at how much distance there was to her drives. I love your blog post, Stacy, because it reminded me of when the three of us played together at Pasfield. Stacy, thank you for sharing all of these wonderful stories about your daughter and my granddaughter. She was so unique in so very many ways. She loved life and did it on her own terms. I thought that I knew her, but I am finding out every time you post a story about her that I missed out on so much. She embraced life with laughter and joy.